"Loud Calls, Talking Caller ID & Answering Machine"
Enjoy loud, clear phone calls, an amplified ringer and visual ring signaler, and hands-free conversations - plus, always know you're dialing correctly! The PowerTel 760 Assure Amplified Corded Telephone with Integrated Answering Machine serves as the corded base model for the 7-Series modular line of telephones. It provides exceptional sound with adjustable amplification and tone control on its easy-to-handle handset. 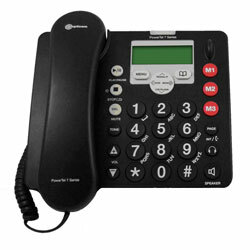 Big buttons on the corded base of this amplified telephone make dialing easy. And just in case, the talk-back buttons allow you to hear the numbers you dial read back to you so you can be absolutely sure you're not accidentally misdialing. With the integrated digital answering machine, you'll never miss an important message from family and friends who are trying to reach you. Includes one Includes one Amplified Corded Telephone with Integrated Answering Machine. Add up to four PowerTel 701 cordless handsets or PowerTel 601 wireless wrist shakers with remote answer and emergency features (extra handsets and wrist shakers sold separately), to create a complete system.